Richard B. Hoover of NASA/NSSTC announced today the discovery of evidence for the detection of a fossilized cyanobacterial mat in a freshly fractured, interior surface of the Orgueil carbonaceous meteorite. Many of the images presented were obtained 21-23 July 2004, using the Field Emission Scanning Electron Microscope at NASA's Marshall Space Flight Center in Huntsville, Alabama. The announcement was made in Denver, Colorado at the "Instruments, Methods, and Missions for Astrobiology VIII" (Conference 5555) at SPIE's International Symposium on Optical Science and Technology (its 49th Annual Meeting). 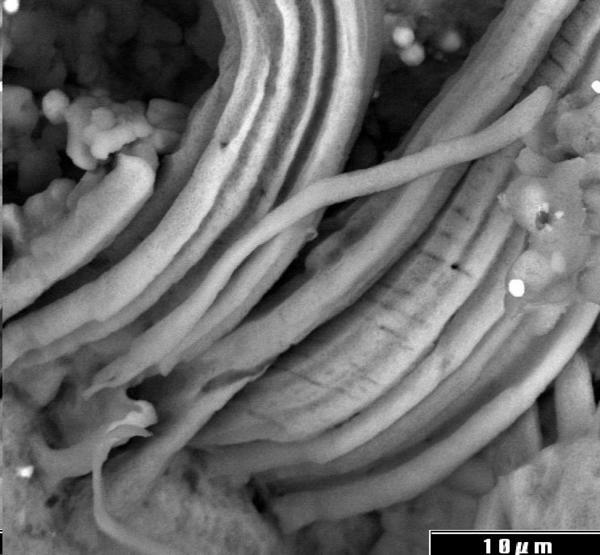 Hoover presented numerous high resolution Field Emission Scanning Electron Microscope (FESEM) images and EDAX Spectral Analysis of the chemical composition of these large, extremely complex, and beautifully preserved indigenous microfossils and microbial assemblages. He also presented images of living and fossil cyanobacteria and sulfur bacteria and data on exotic mineral microstructures that he had also found in the carbonaceous meteorites. Many of these microfossils shown were clearly recognizable as the mineralized or carbonized remains of cyanobacteria. The cyanobacteria are well known and long-studied oxygenic phototrophic prokaryotes. Since they obtain their energy by photosynthesis, they do not infiltrate the interiors of opaque, black rocks, such as carbonaceous meteorites. Some Antarctic forms are cryptoendolithic and grow during the continuous sunlight of the polar summer, appearing as bright green bands near the surface of moist translucent rocks. Many of the fossilized cyanobacteria (and filamentous sulfur bacteria) are very large — 1 to 10 microns in diameter and with filament lengths sometimes in excess of 150 microns. Although many of the forms discovered in the meteorite have not yet been identified, several have. Many of the forms have the correct size of trichomes and sheaths, and exhibit complex morphology, branching, and other features, such as the presence of germlings, heterocysts, apical cells, akinetes, and hormogonia that permit them to be recognized and their taxonomy established in accordance with the characteristics set forth in Bergey's Manual of Systematic Bacteriology, Vol. 1 (1). 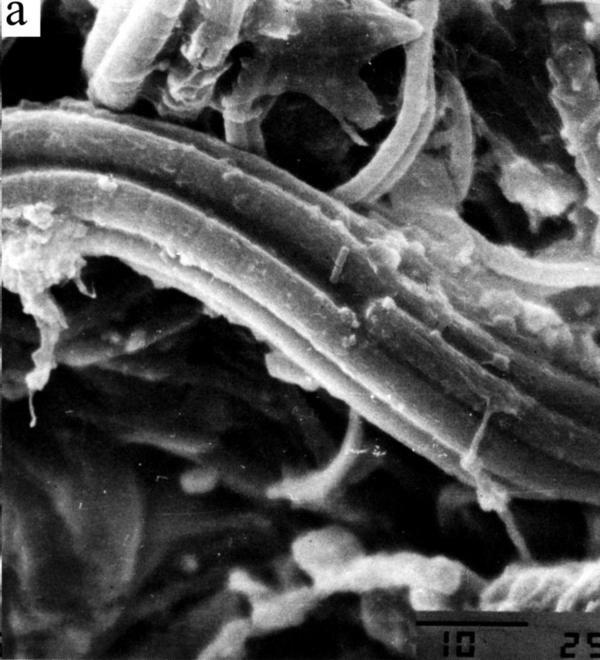 Genera and species of ecologically consistent communities of filamentous sheathed cyanobacteria (e.g. Microcoleus spp., Nostoc, spp., Phormidium spp., Mastigocladus spp., etc.) have been found in association with sulfur bacteria and haloalkaliphiles. Hoover presented several dramatic images and the associated EDAX spectral data of living and fossil cyanobacteria haloalkaliphilic mats, the Cambrian phosphorites of Khubsughul, Mongolia for comparison with the recent discoveries in the Orgueil and Murchison carbonaceous meteorites. Evidence for possible microfossils in meteorites was previously reported in numerous papers by many scientists (Nagy, Claus, Timofeyev, Van Landingham, Palik, McKay, Rozanov, Hoover, etc.) These results have previously been attacked by critics, who have argued to dismiss them on the basis that they were too small to represent living organisms or that they must be mineral grains, artifacts produced by coating the sample, or recent pollen or fungal contaminants that were introduced during acid maceration, cleaning, or while the specimen was lying in some museum drawer. Hoover detailed his extensive sample handling and contamination prevention protocols and described the chemical and microbiological rational why these lithified and carbonized remains could not be logically dismissed as recent contaminants. He also discussed the the microbiology, bioenergetics and life habits of phototrophic and chemilithotrophic bacteria, the chemical compositions and mode of preseveration of the microbial remains, and the ecological, environmental, reproductive, and community association aspects of the microbial communities of cyanobacterial mats such as those found in the meteorites that indicate the forms discovered can not be logically dismissed as either mineral grains or post-arrival microbial contaminants. The recently discovered microfossils are not isolated single cells, but represent mats of cyanobacteria and sulfur bacterial and ecologically consistent communities and assemblages. Hoover concludes that these communities grew on the meteorite's parent body before it entered the atmosphere of Earth. Hoover has described these details and provided High Resolution FESEM Images and X-Ray Spectral Data in a paper that will appear in the Proceedings of the SPIE Conference 5555 (3). Additional images and elemental data are now being obtained to be included in other papers that are now being prepared for submission to scientific journals. Meanwhile, Hoover's best new images from Orgueil are not shown here. 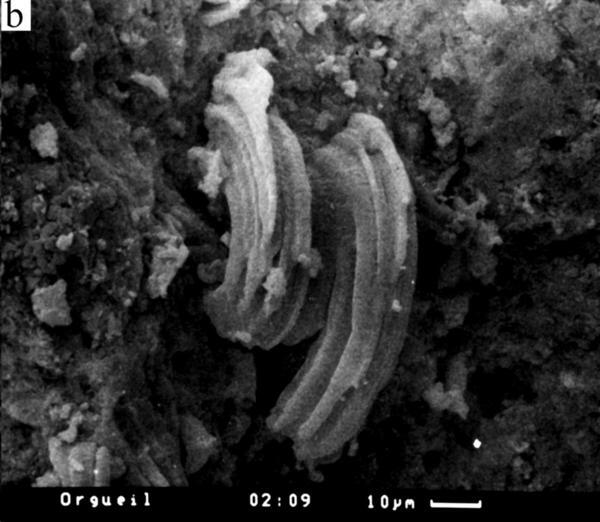 Microfossils in Orgueil; photo by Richard B. Hoover, NASA/NSSTC, 21-23 July 2004; sample courtesy of Paul Sipiera, the Dupont Meteorite Collection of the Planetary Studies Foundation. 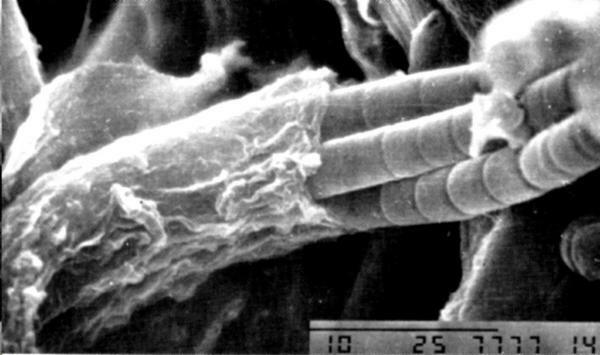 Living cyanobacteria Microcoleus chthonoplastes with trichome bundles in a common sheath, for comparison to microfossils from Orgueil; photo by Ludmilla Gerasimenko, Institute of Microbiology, Russian Academy of Sciences (2). Microfossils in Orgueil; photo by Alexei Rozanov, Paleontology Institute, Russian Academy of Sciences; sample courtesy of E. Galimov, Vernadsky Institute, RAS. Living cyanobacteria Microcoleus chthonoplastes emerge from wrinkled muscilaginous sheath, showing individual cells in filament, for comparison to microfossils from Orgueil; photo by Ludmilla Gerasimenko, Institute of Microbiology, Russian Academy of Sciences (2). 13 Jun 2016: Meteorites contain evidence for extraterrestrial life, in spite of earthly contamination. R. B. Hoover, "Comets, carbonaceous meteorites, and the origin of the biosphere" [abstract, pdf], p 23-70 v 3, Biogeosciences Discussions [contents], G.A. Zazarin, A.Y. Rozanov, N.A. Kolchanov, and F. Westall, eds., Jan 2006. Richard B. Hoover, "Mineralized Remains of Morphotypes of Filamentous Cyanobacteria in Carbonaceous Meteorites" [abstract], doi:10.1117/12.624419, p 166-182, Proceedings of SPIE Volume 5906: Astrobiology and Planetary Missions [contents], Richard B. Hoover, Gilbert V. Levin, Alexei Y. Rozanov and G. Randall Gladstone; eds., Sep 2005. Rob Sheldon, a Hoover colleague, comments, 25 Oct 2004. Richard B. Hoover et al., "Astrobiology of Comets" [abstract | html], doi:10.1117/12.566496, Proceedings of SPIE 5555, "Instruments, Methods, and Missions for Astrobiology VIII," Richard B. Hoover; Gilbert V. Levin; Alexei Y. Rozanov, eds., 1 Nov 2004. 2 Aug 2004: "Microfossils in a meteorite" — CA's original announcement of this new page, with links to other examples of microfossils in meteorites. 1. George M. Garrity, Editor-in-Chief, Bergey's Manual of Systematic Bacteriology, 2nd Ed., Vol. 1, The Archaea and Deeply Branching and Phototrophic Bacteria, New York, Springer-Verlag, 2001. 2. Elena A. Zhegallo, Alexei Yu. Rozanov, Galina T. Ushatinskaya, Richard B. Hoover, Ludmila M. Gerasimenko and Alla L. Ragozina, Atlas of Microorganisms from Ancient Phosphorites of Khubsughul (Mongolia), NASA/TP 209901 (In English and Russian), pp. 1-167, 61 Figs. (2000). 3. Richard B. Hoover, Gregory Jerman, Alexei Y. Rozanov and Paul P. Sipiera, "Indigenous microfossils in carbonaceous meteorites" [abstract], p 1-17, Proceedings of SPIE Volume 5555: Instruments, Methods, and Missions for Astrobiology VIII, [contents], Richard B. Hoover, Gilbert V. Levin and Alexei Y. Rozanov; eds., ISBN 0-8194-5493-1, Nov 2004.